Strong thunderstorms likely. Low 51F. Winds W at 10 to 15 mph. Chance of rain 100%..
Strong thunderstorms likely. Low 51F. Winds W at 10 to 15 mph. Chance of rain 100%. West Lauderdale players and coaches hoist the Class 4A championship trophy following Saturday's game. West Lauderdale's Anna Claire Nance, left, and Lucy Green take a selfie with each other as they hold up their MHSAA Class 4A state championship gold medallions Saturday after defeating Florence at Ridgeland High School. West Lauderdale head girl's soccer coach Alex George hugs Jada Smith as they celebrate defeating Florence for the MHSAA Class 4A state championship Saturday at Ridgeland High School. West Lauderdale's Emily Aras, center, is hugged by teammates Rylee Dunlap and Emma Ramsey after defeating Florence for the MHSAA Class 4A state championship at Ridgeland High School Saturday. West Lauderdale's Lucy Green fights her way around a Florence defender during the MHSAA Class 4A state championship at Ridgeland High School Saturday. West Lauderdale's Alice Williamson tries to get the ball past the Florence keeper Saturday during the MHSAA Class 4A state championship at Ridgeland High School. West Lauderdale's Ember Temple collides with Florence keeper Olivia Burnham as she goes in to try for a goal Saturday during the MHSAA Class 4A state championship at Ridgeland High School. West Lauderdale's Anna Claire Nance gets tangled up with a pair of Florence defenders as she works her way toward the goal Saturday during the MHSAA Class 4A state championship at Ridgeland High School. 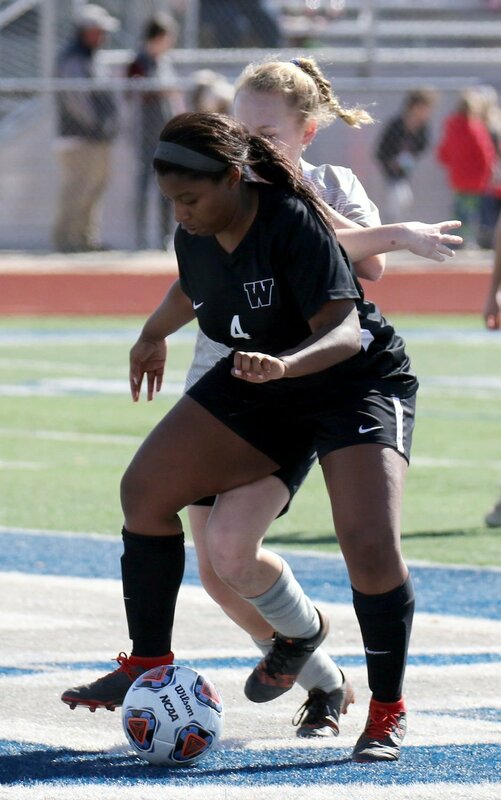 RIDGELAND — Last year, the West Lauderdale girls soccer team scored two first-half goals and fell to Florence 3-2 in overtime during the MHSAA Class 4A state championship game. This year, a single goal would have been enough. The Lady Knights used three to shut out Florence and win their third state title in four seasons, avenging the loss against Florence from a year ago in the process. The Lady Knights stayed aggressive throughout the duration of the game, resulting in three first-half goals and no shots on goal by Florence in the second half. In fact, the Lady Eagles managed just one shot on goal in the entire contest, giving West Lauderdale keeper Kristin Hayes her only save. Senior Caroline Green got West Lauderdale its first goal in the eighth minute, and the Lady Knights made it 2-0 in the 24th minute when Ember Temple scored on a header off an assist by Alice Williamson. Jada Smith, the Lady Knights’ other senior, made it 3-0 off a penalty kick when Florence was called for a hand ball in the 30th minute. West Lauderdale’s passes were crisp and often on point, which allowed the Lady Knights to move the ball and maintain pressure on the Lady Eagles. Thursday, Temple recalled poor teamwork being a contributing factor in the Lady Knights’ title-game loss last year and said it was the opposite Saturday. The shutout capped off a postseason run in which the Lady Knights didn’t give up a single goal, outscoring their four playoff opponents 33-0. Sophomore Addisyn Pope credited George’s coaching with the team’s defensive success throughout the entire year. “Coach George has really worked on us in the midfield as far as how to defend the other team, and we just perfected it well,” Pope said. Pope played a big part in West Lauderdale’s shutout Saturday, earning praise from George for her ability to help shut down Florence’s attempts to push the ball up the field. Pope said she was more than happy to do her part, even if it wasn’t as flashy as scoring a goal. “Just getting the ball in the middle and then turning and looking for the other side and switching the field a bunch,” Pope said when asked what the key to her success was. The Lady Knights had several more chances to score in the second half but couldn’t quite find the net. It didn’t cost West Lauderdale, though, and the constant shots on goal were a big help in keeping Florence off the board. Temple said she had no regrets as far as not scoring in the second half. Getting the win was all that mattered to her. “We played as hard as we could, and we went out with a bang, so we’re good with that,” Temple said. Overall, George said his team stuck with the successful formula it’s had all postseason: playing loose and not letting the other team dictate the flow of the game. Green, who doesn’t plan to play soccer in college, said she couldn’t have scripted a better final game for her high school career. Smith, a Jones College signee, said she’s grateful to have been a part of the previous two titles, but the third one was extra-special due to it being a sendoff game for her. For both Green and Smith, the other West Lauderdale players are more than teammates. The Lady Knights finished the year 24-0-3 with a No. 1 ranking in Mississippi and a No. 6 national ranking by MaxPreps.com.